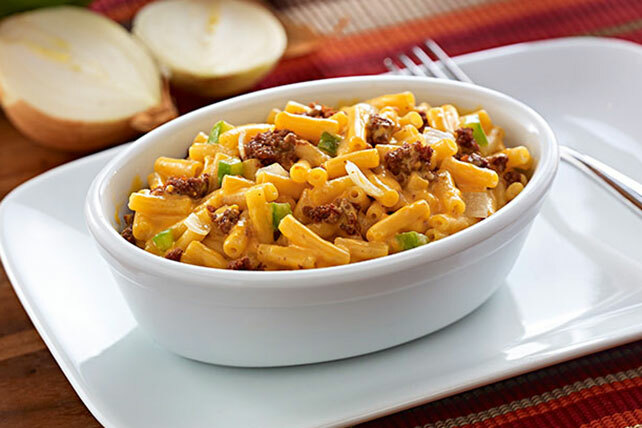 Chorizo sausage, onion and green pepper add Mexican flavor to a macaroni and cheese dinner. Serve as a festive main dish. Add remaining ingredients; mix well. Cook 3 to 5 min. or until heated through, stirring occasionally. Spice up your Cinco De Mayo celebration with a serving of this festive dish. Prepare as directed, substituting 1/2 lb. shredded cooked chicken, 1 rinsed 15-oz. can pinto beans, 1/4 cup chopped red peppers and 1 tsp. ground cumin for the chorizo, green peppers and onions. Substitute 1 drained 4-oz. can chopped green chiles for the green peppers and onions.